Our church has been in existence since the beginning of the 20th century. It was built with money from Miss Frances Ellis, and her sister. They bought the land from the London, Brighton and South Coast Railway Company, and the church was built and opened in 1908. The first Mass on the 13th September was attended by about twelve people. One of the earliest collections recorded was for one shilling (five pence in today's currency). Frances Elizabeth Ellis was born into a wealthy family in Brighton in 1846 and raised as an Anglican. She was left a considerable fortune by her father, and devoted much of her adult life to caring for her blind mother and infirm sister. She seems to have been drawn to the Catholic faith while staying at Ramsgate in Kent. It is said that she was particularly impressed by the piety of a Mr. Leahy, whom she observed walking to Mass at St. Augustine’s abbey every day and in all weather. However that may be, Mr. Leahy does seem to have been instrumental in introducing her to prominent members of the Southwark clergy, including Canon St. John, who was closely involved in fund-raising. These churches started life as missions rather than parishes, underlining the precarious — and hopeful — circumstances of their foundation. Miss Ellis particularly favoured a Romanesque style with a single large circular window at the west end, but as money was short, they were mostly without ornament. Usually, Miss Ellis insisted on employing an architect whose normal line of work was designing railway sheds, and this utilitarian approach is in evidence at Norbury and a number of other churches in Southwark. As in all the Ellis foundations there was to be a monthly Mass for the Holy Souls, something that continues to this day at St. Bartholomew’s as the monthly 'Ellis Mass for the dead’ in their memory. Miss Ellis died at The Daughters of the Cross Home at Hayle which she had been instrumental in having built in 1930. As with most of the Ellis churches, the original church of St. Bartholomew’s was very small, consisting of the main high altar, what is now the front portion of the nave (only as far back as the first pair of pillars), and the two corresponding side chapels, together with a small presbytery attached to the church at the east end. It seated around 130 people. It was designed by Benedict Williamson, and is built with London Stock Brick. Until 1918, when Fr. William Taunton took up residence, the church was served from English Martyrs, Streatham. St Bartholomew's was officially made a parish under his auspices in 1920. There have been a huge number of developments and changes at St. Bartholomew's carried out by the many priests and people who have been part of our parish. The Church was first extended in 1929 when Fr. Alexander Trew was parish priest (1926-1938). The nave as we now know it was added, together with a baptistery (now a Reconciliation Room), confessionals, porch and, again, a circular window at the west end above a small choir loft that was accessed by way of a spiral staircase from the south end of what is now the porch. The extension cost £4,000 and the manner in which the extension fits so perfectly with the original building suggests that it was probably again to a design by Fr. Benedict Williamson (he was ordained in 1909). A small 'positif' organ, with a single manual and no pedals was added to the north end of the choir loft shortly afterwards, and was originally hand blown (a small electric BOB blower was added in later years). Fr. Miller (1945-63) commenced the first stage of the further enlargement of the presbytery, but only the ground floor had been completed by the time he retired in 1963. ​While Fr. Carolin was parish priest (1963-1993) there were further changes and additions. In 1964 the bare brick walls were plastered over and painted white and a much larger choir Gallery was built in 1966, with the spiral staircase in the porch being removed to be replaced by a small extension to the nave on the south side, which gave a small porch with access to the main body of the church and access by stairs to the new gallery seating 80. The glass screen between the church and the porch was added as a 'crying room' space, with an addition to the sound system added so that mothers and fathers with their infants were able to continue to follow and participate in the Mass. Confessionals were built alongside the baptistery off the nave, and the total cost of the works amounted to £5,000. In 1966-67 a further £23,000 saw the retro-chapel built, with the back wall behind the altar broken through and replaced by three arches allowing sight of the altar and the main body of the church. This immediately and significantly increased the number of seats available to the growing people attending Masses on Sundays by 120. A new sacristy was built at the same time, and the old sacristy facing onto Ellison Road became redundant. The upstairs portion of the extension to the presbytery was finally completed, replacing the element lost by the addition of the retro-chapel. All this work took place under the auspices of the architect Anthony Stalley of Broadbent, Hastings, Reid & Todd. A new organ was built in 1971 by F.H. Browne and Sons of Canterbury at a cost of £11,000. It was installed in 1972 and the opening recital on 22nd November was given by Fr. Peter Farmer, the Southwark Diocesan Music Advisor who, together with Anthony Price, the parish organist, had advised Fr. Carolin on the specification and design of the instrument. The organ's specification was variously enlarged, altered and updated in 1985, 1996 and 2005. Over subsequent years the west end rose window (Christ the King 1973), the octagonal repository filling the space at the west end between the baptistery and the porch was added (1974), and the mosaics over the main doors and around side altar and Marian shrine (1976), the stained glass windows high in the nave (the four evangelists 1981), the Lady Chapel (The Nativity 1981), the Blessed Sacrament chapel (The Last Supper 1981), the porch (scenes from the life of St. Bartholomew 1981) and the baptistery (Baptism of Christ 1981) were added, mostly to designs by Hardman & Son. The church was consecrated by Bishop Charles Henderson, Auxiliary Bishop in Southwark, on 6th May 1975. The weekly Sunday Mass attendance in 1982 was shown in the Southwark Catholic Directory for the year as 2010, a significantly greater number than the 120 originally envisaged 100 years earlier. Masses were celebrated at 6.15pm (vigil), 8.30, 10 and 11am, 12noon and 5pm, with Benediction every Sunday afternoon at 4.30pm. In 1996, while Fr. Michael Jones was parish priest (1993-2004) the church was substantially re-ordered to designs by Tim Gough of Austin Winkley Associates. The three arches separating the retro chapel from the main body of the building were opened up to one very much larger arch (something that was not technically possible back in 1966).The new Altar, the cross over it (depicting Christ Crucified on one side and The Risen Christ Reaching for His Crown on the other), Sanctuary Chairs, Lectern and Baptismal Font (all to designs by David John) were installed, as were the Reconciliation Room (previously the baptistery) and Sacred Heart Shrine. The 'Holy Spirit' painting on the rear wall of the retro-chapel was painted by Marianne John. The original Sacristy (the extant nave arch to the door to which became the entrance to a passage linking the nave and retro chapel) became a parish library. The sanctuary is circular, with a cut-out at the east end to accommodate the new baptismal font, and a cut-out at the west offering access steps to the altar that were designed to be deep enough to permit seating for a choir for the purpose of performances of sacred choral music. The Stations of the Cross (origins unknown) were re-distributed from the main nave to encompass both the nave and retro-chapel. Over the years the Presbytery has also undergone considerable extension and alteration. In 2004 the parishioners raised over £20,000 in response to an appeal for £15,000 as a result of Fr. Michael's encouragement to ensure the Organ received a significant enlargement and refurbishment to ensure its continued service into the decades ahead. The works were carried out in 2005. Fr. Michael left us in 2004 to become Parish Priest at St. John Vianney, Bexleyheath, and Fr. Tom Cooper replaced him. Fr. Tom left us for a 'Sabbatical' in July 2013 before being appointed Parish Priest at Petts Wood from September 2014. Our extant curate, Fr. Deodat Msahala from the diocese of Mahenge in Tanzania, was then appointed Parochial Administrator, and was duly installed in February 2014. In February 2017 we welcomed Fr. Innocent Ezeonyeasi to assist him. A complete list of present and past clergy at St. Bartholomew's may be seen here. Over the past years priests and people here have worked hard to build up the parish as a community of faith. The parishioners have been very generous in raising money for the various building works the parish has undertaken and St. Bartholomew's has a reputation for being generous in providing financial assistance to charitable causes and other parishes. There are many organisations and groups in the parish as well as many ways of taking an active part in the Liturgy. The Non-Drip Measure Factory (originally a hand laundry) next door to the church, at the junction of Ellison and Danbrook Roads was purchased at the instigation of Fr. 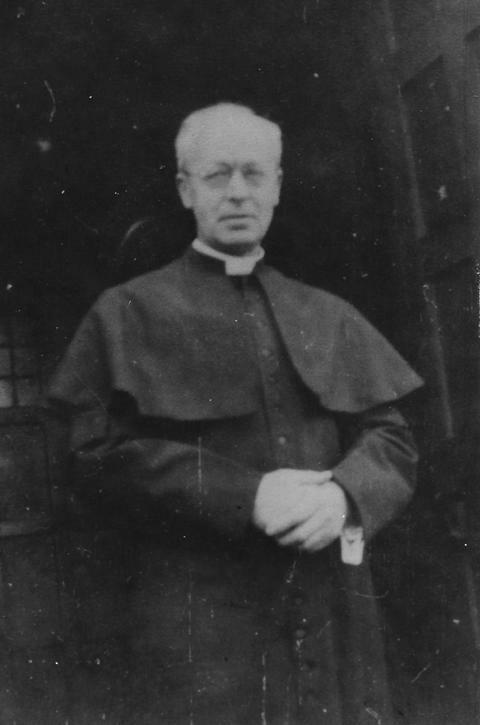 Charles Byrne (1944-45) just before he departed in 1945, and his successor, Father Basil Miller, converted the building into a thriving parish centre. It was officially opened by the then famous local Catholic TV actor Derek Guyler in 1959. During the early 1970's work was started in the Upper Hall and in 1976 a Parish Social Club was opened. The Hall had a complete refurbishment in 2003 under the guidance of Fr. Michael Jones (1993-2004). The Parish Social Club closed prior to this, but new modern bar facilities for parish and private functions were built into the refurbishment, as was a lift between the two floors. In 1938 the parish priest at St. Bartholomew's, Fr. Cyril Walmsley (1938-44), bought a triangular plot of land bordering Chestnut Grove, Sherwood Park Road and Fern Avenue, with its apex at the roundabout in Pollards Hill, and had a dance hall built to develop as a Mass centre. 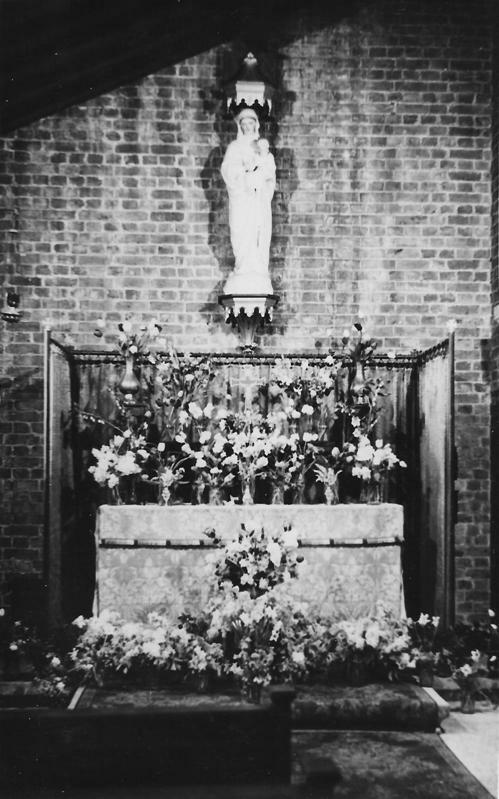 The first Mass was celebrated there on 12th March 1939. The Sunday Masses were at 8.30am and 10.30am, and the parish priest and curate at St. Bartholomew's alternated to say these Masses each week. This necessitated a visiting priest arriving at St. Bartholomew's each Sunday to say the two mid-morning Masses - most notable of these over the years were Fr. (later Monsignor) Richard Kenefeck (who was headmaster of Cardinal Vaughan Grammar School, Kensington) and Fr. Roger Nesbit (chemistry and RE master at The John Fisher School, Purley). 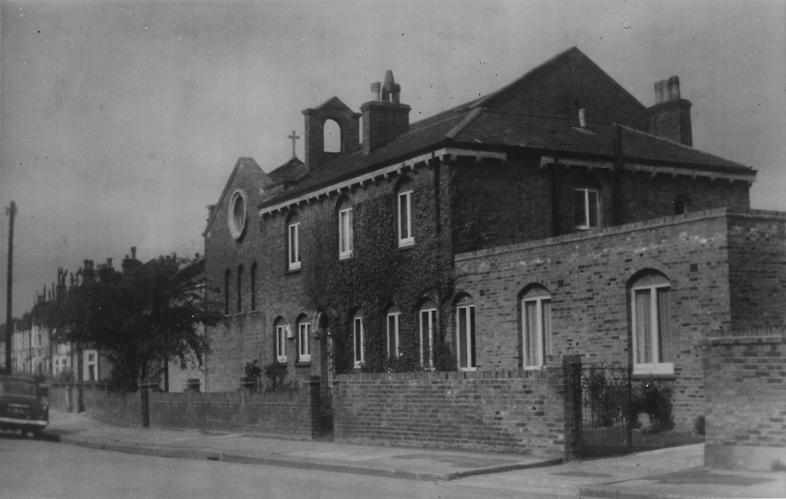 What became known within parish and local Catholic circles as 'The Hall' became St. Michael's, a semi-independent parish, in 1964. The first resident of the new presbytery, built at St. Michael's with the generosity of the parishioners of St. Bartholomew's, was Fr. Kenneth Palmer who was appointed as 'Priest-in-Charge', with the responsibility for the administration of the parish being transferred from St. Bartholomew’s to Fr. Terence Donovan (d. 1983), Parish Priest at Ss. Peter & Paul, Mitcham. The first to be inducted as Parish Priest at St. Michael's was Fr. William Gallagher in 1982, and it was only then that St. Michael's became a completely independent Parish.